The ‘Low Fin Tube’ is also known as Integral Fin Tube. This type of fin tube is widely being used in the Industry Today. The Low Fin Tubes/ Integral Fin Tubes are increasingly being used in various Fluid Heat Exchangers. 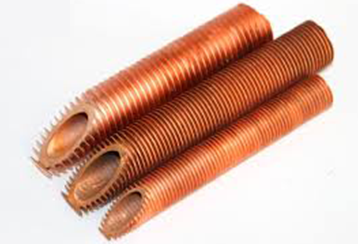 Unlike other Fin Tubes the application is not limited to Air – Fluid type of heat exchangers . As a result they are used in varius types of Shell And Tube heat exchanger also . The fins are manufactured rolling the Fin in the Base tube Itself. The fin height is relatively very low. However number of Fins Per inch or the fin Density can be increased greatly and improve the heat transfer area. The rolling is done on a special machine and the same can be supplied in straight as well as U bend configuration. These Fin Tubes find applications in the Oil Coolers , Shell and Tube Heat Exchanger etc. Manufacturing Process: – Cold Rolling of Fin on the Base tube Itself. We can supply material on urgent delivery basis because of large stock and relations with raw material suppliers. We use only Prime Quality base tube and Aluminium Material. The Extruded fin Tubes can be supplied with EN 10204 EN 3.1 and EN 3.2 certifications. We can provide Third Party Inspection from any reputed inspection agency.